Our new Student Handbooks are now available for purchase! The Handbook is the result of years of experience, careful thought and review. I appreciate the time and effort of all the contributors that made it possible. Special thanks to Lee Deline, who was instrumental in the layout and production. An expanded discussion of our lineage and community. A much expanded Youth/Junior curriculum, including some important updates to the existing curriculum that are now official. I’m proud to say, the attractive binders used for the Handbook are custom-made here in Ontario. They feature our Academy logo, dividers and a handy pocket on the inside for your Student ID card. The Handbook is $20 including HST. For families, a second handbook is $15 and subsequent are $10. Payment can be made by cash, debit, cheque or e-mail transfer. Please stop by the office to get one. 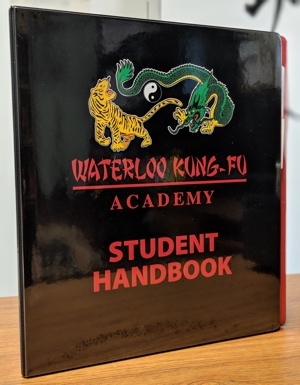 The handbook is an important part of our curriculum and your journey at the Academy, so my expectation is that each student in the Youth/Junior/Adult program has one.